Homemade milk kefir is made from kefir grains, which are a symbiotic colony of bacteria and yeast. It traditionally used as a drink, but it’s also great for smoothies or as a buttermilk substitute. It can even thicken so that you use it like yogurt. Homemade kefir is not the same as store bought kefir. Store bought kefir is really just yogurt in a liquid form. Homemade kefir tends to have a stronger flavour and can even be sparkling when fresh. 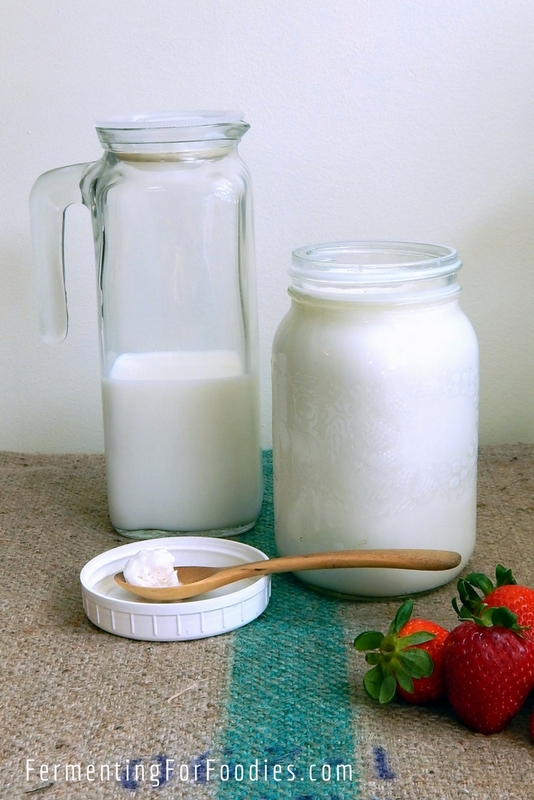 Milk kefir is the perfect dairy culture for home use. It is much easier to maintain then yogurt. 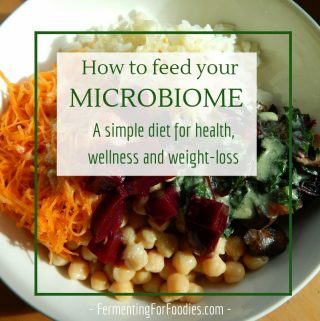 It ferments at room temperature, and you don’t need to preheat the milk before culturing. Milk kefir is a great replacement for buttermilk in baking. You can culture whipping cream. You can make kefir cheese. 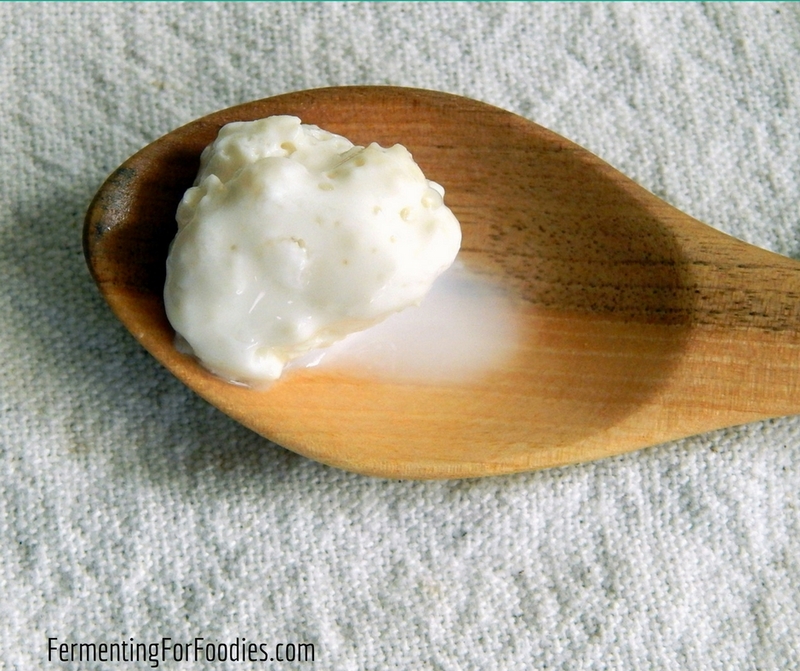 Kefir can be used as a starter culture (either as whey or straight kefir) for most everything. or make friends with someone who has grains. Here’s a picture of my kefir grains. When I was a Tracebridge, Katie’s grains were very different from mine… more like water kefir grains. So clearly there are a few strains out there! Put the milk and kefir grains into a glass jar. Leave in a warm location for a minimum of 8 hours, and up to 48 hours depending on how strongly flavoured you want your kefir to be. Remove the grains and reserve for future use. -My kefir culture usually floats, so I simply scoop it out with a spoon. If it sinks, then I pour it through a strainer. -If you have too many grains, or you leave your kefir out on the counter too long you will end up curdling your milk. This is perfectly good to eat! Read up on kefir cheese to know how to use your over-cultured milk. Kefir is happiest in fresh milk at room temperature. Try to pace your culturing with your consumption so that you can keep your kefir out of the fridge. If you only use a little bit of kefir, then just culture 2 cups with 1 tbsp of grains. Alternatively, you can store your kefir in the fridge with lots of milk for 1-3 weeks. I’ve even left it for up to 4 weeks while we were on vacation. It wasn’t happy. But a few batches of milk later we were back in business. Happy kefir will keep multiplying, so you’ll quickly end up with more grains then you’ll need. Though the grains are edible, I would recommend passing them along to a friend instead (or otherwise disposing of them). Kefir can cross contaminate with other cultures (yogurt, sourdough, etc) so it’s best to culture them in a separate rooms of your house. 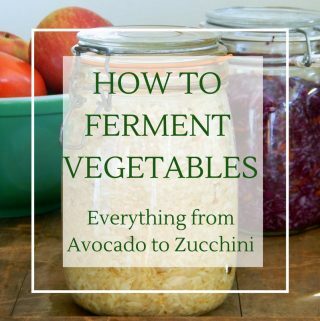 I do all my kefir culturing in the kitchen, sourdough in the living room, yogurt in the dining room (I’ve had kefir grow in my yogurt before) and other ferments in the bedrooms. You don’t need to wash your grains. They just need fresh milk to keep them healthy and strong. Water is unnecessary and probably harmful considering the potential risks of chlorine for our little friends. You can use metal utensils… unless you use really old-school copper or iron utensils… then the latic acid of the milk might damage your utensils. Otherwise stainless steel is fine. We always a have a fresh jug of this in the fridge for morning cereal. 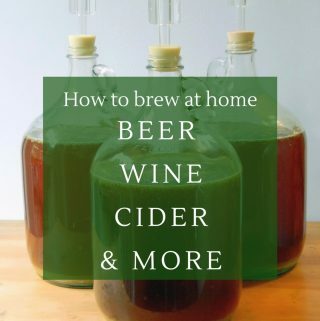 We leave it out on the counter for the day or the night only to prevent it from getting too fermented; kids dig it as long as it’s not separated. We also noticed that sometimes it turns into a wonderful yoghurty version of itself, with these huge blocks of curd that are like sweet yoghurt. It’s not consistent though. Do you know how or why that happens? There are lots of factors that can affect how fast kefir ferments. The grains to milk ratio, room temperature. Kefir has a bit of its own Goldilocks effect. 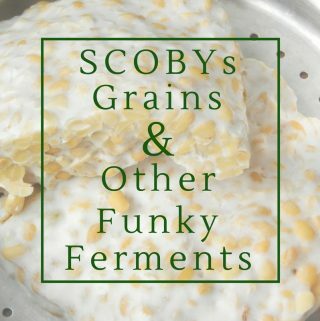 You can also get nice thick kefir from culturing it with the grains for a shorter time, then letting it finish fermenting without the grains. There have been few times after 12-24 hours, the milk has not thickened and it is the same consistency of when I poured out in. Any ideas about that? 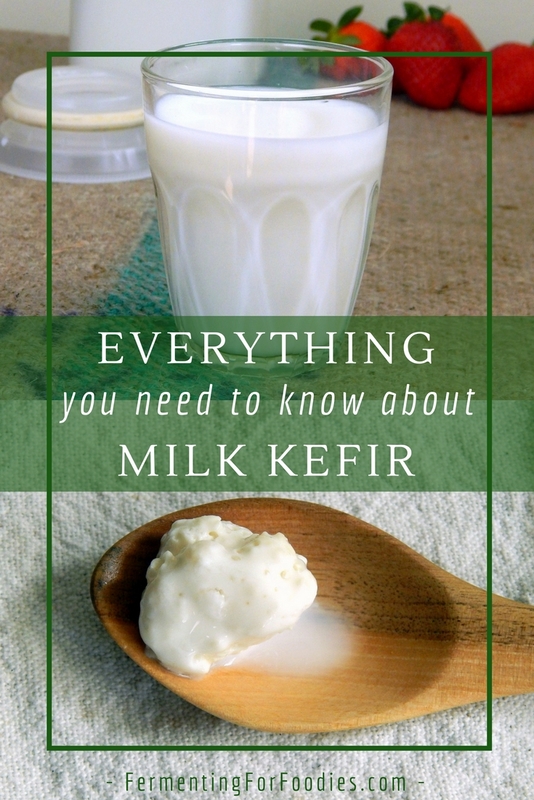 I have made kefir every day for the past 6 years… and I would have to say that kefir is moody. 🙂 I find it thickens best when in a container that it has already cultured in a few times. But it’s also a bit like Goldilocks… it likes it warm, but not too warm. Enough grains but not too many grains. Thanks for the tips. The ‘don’t use metal utensils’ myth stopped me from staring my batch. Do you know how hard it is to find a nylon sieve? Have just discovered Ribot milk (Lait ribot) here in France which I’m pretty sure is a version of kefir, any ideas?